The Guest house was originally built in the 1950’s as police houses and later turned into bed sits in the 80’s. Then in December 1989 was bought by the Harrises and was changed into the guest house. It has 7 bedrooms all en-suite. 1 Twin downstairs disabled friendly. 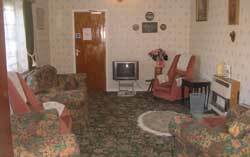 All bedrooms are en-suite and include Tea/Coffee making facilities and Colour Television. We serve full breakfast. Breakfast Times: 06.30hrs till 08.45hrs. Car parking at front and back for guests. 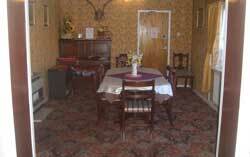 Residents Lounge and Dining rooms. The Tremains Guest House is within 5 minutes walking distance of the town centre. Bridgend is on the banks of the river Ogmore. There are three castles within the area. In the 20th Century the town developed into a market town. The present name of the town is authentically derived from the name "Brynggen Eynde" and is mentioned in a document dated 1447 - soon after the first bridge was erected. The name evolved over many years until its present day version of Bridgend and its Welsh equivalent Penybont ar Ogwr. The town is near the M4 Motorway and has a mainline station from London to Swansea and a bus station. Cardiff International Airport is a 20-minute journey, 8 miles from the sea, and 20 minutes from the mountains. The cities of Cardiff and Swansea are 20 miles from the town. Shopping within the town offers small specialist shops, pubs and eating places. The Rhiw arcade has a number of shops as well as the town's indoor Charter Market. McArthur Glen Designer Outlet, Wales, is 5 minutes by road outside the town, with over 60 stores, a food court, a Cinema and car parking, also a free bus from the town centre. Places to visit around Bridgend: Bryngarw country Park, Ewenny Potteries and Priory, Glamorgan Heritage Coast, Kenfig National Nature Reserve, Margam Abbey and Park, The Museum of Welsh life at St Fagans, Porthcawl and of course the Valleys of South Wales.